PaintScratch.com sells the highest quality Nissan paint pens for all Nissan years and models. Order a Nissan paint pen for your vehicle by clicking your model above. 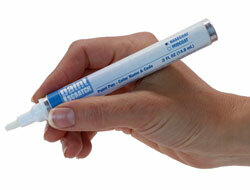 Next select your Nissan year and color order your Nissan touch up paint pen. Founded in 1933, Nissan is one of the world's largest automakers. In recent years, they have sold over 4,000,000 automobiles around the world. Every day, hundreds of Nissan owners visit our site hoping to find a way to repair paint damage their vehicles have unfortunately received. If their paint scratches, chips, or dings are small, a Nissan touch up paint pen is a convenient way to touch up that paint damage. At PaintScratch, we sell the highest quality Nissan paint pens available so you can complete a touch up job that comes out great. Our database of Nissan touch up paint pen colors is enormous - as of this writing we've got over 4,000 listed going back all the way to 1964! Find your color and order a Nissan touch up paint pen from our site today.